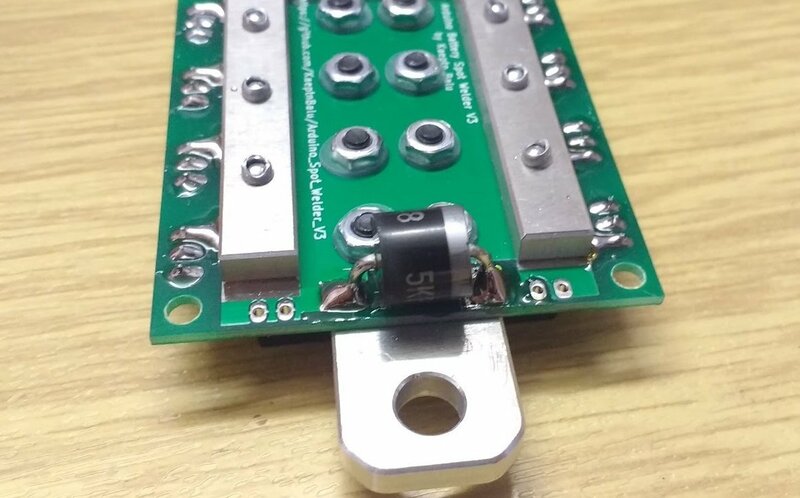 Although the SMD TVS diode has pretty much the same specs as the bigger through hole TVS Diode used on the previous Spot Welder versions it seems to struggle with very strong car batteries. There where some fails of the diode reported by users who used 800 CCA or stronger batteries. So i decided to replace the diode with the through hole version, which is a bit more robust. I do still recommend to use car batteries between 400 to max. 600 CCA to power the Spot Welder. These will guarantee a reliable operation and long lifetime of the unit. All prebuilt kits shipped from now on will come with the bigger TVS diode installed. If you already bought a prebuilt kit and have trouble with the SMD diode contact me and i will ship you the bigger one for free. Or if you can not replace it yourself i will exchange your mosfet board for free. Step 1: Desolder the SMD TVS diode and scratch of the solder stop paint from the ractangle part with the many holes on the pcb with a box knife. 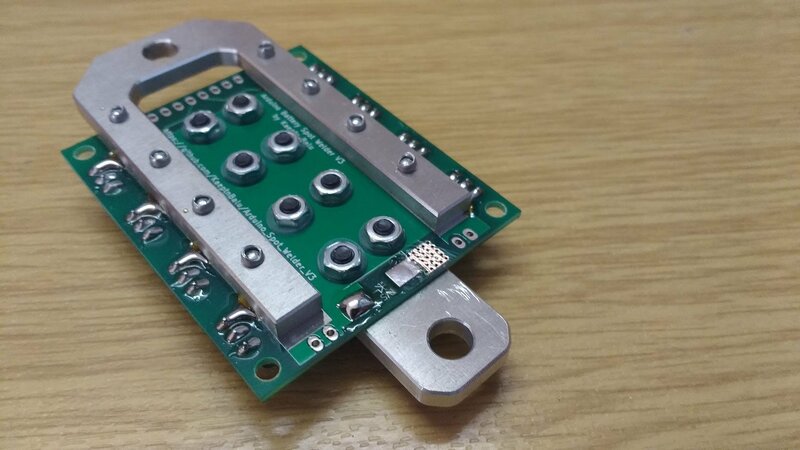 We need this because the through hole TVS diode is a bit wider than the SMD version. Step 2: Add some solder to the blank copper on the scratched area. Step 3: Bend the through hole TVS diodes legs 90 degrees as close as possible to the diode and cut them short so the diode can be mounted on the pcb. Then put some solder on the legs and solder the diode to the pcb. Solder the left side first. When the diode stays in place solder the right side (scratched pcb side). Make sure to use a powerful enough soldering iron so you dont heat the diode very long. It is necessary to solder the diode directly on the pcb without extension wires. This way it does the best job eliminating the high voltage spikes. I can confirm that 5.0smdj13a diodes are weak, and blowns up. I killed 3pieces 5.0smdj13a diode, i use 5.0Ah Turnigy Graphene 3S 65C battery. I have to add ~2mOhm dumy resistance to the input battery wire, by this way i can spot weld. Without this only survive 2-5 spot weldings. Have not tested with the dummy resistor many times yet. Only 10+ times, but i hope will last long. The only problem is that the dummy resistor heating up very quickly. So probably i have to ad i will change the TVS diode. These Through holed version TVS diode survive the higher current capability batteries? This Turnigy Graphene Lipo battery has a extrem low internal impedance. I think thats the reason why you needed to add the dummy resistor. 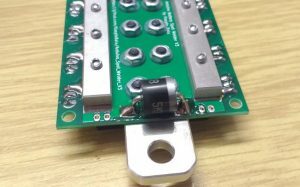 You can put for example 2 TVS diodes in paralell to make it more current resistant. 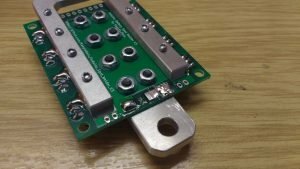 Hi, I bougth a Spot Welder V2 a couple years ago and no problem with the module. The only problem is the battery car because is expensive and is necessary to charge. I would like to know if is possible to replace battery car with a capacitors bank maybe. It has many information on how to use a super capacitor with the welder.